​Ogoni territory lies on 404 square miles of the coastal plains terraces to the north-east of the Niger River Delta. Inhabited by about a million people, its population density is among the highest in any rural area of the world. The Ogoni people have settled in this area as farmers and fishermen since remembered time and had established a well-organized social system before the British colonialist invaded them in 1901. Within thirteen years, the British are destroyed the fabric of Ogoni society. British rule of the area was "haphazard" and no treaty was signed with the Ogoni. By 1960, when colonial rule ended, the British had consigned the Ogoni willy-nilly to a new nation, Nigeria, consisting of 350 or so other peoples previously held together by force, violence and much argument in Britain's commercial and imperial interests. The nation which the British left behind was supposed to be a federal democracy, but the federating ethnic nations were bound by few agreements and the peoples were so disparate, so culturally different, so varied in size, that force and violence seemed to be the only way of maintaining the nation. In the circumstances, the interests of the few and weak such as the Ogoni were bound to suffer, and have suffered. Petroleum, the symbol of Ogoni agonies and pains, was discovered in Ogoni in 1958, and since then an estimated 100 billion US dollars worth of oil and gas has been carted away from Ogoni land. In return for this, the Ogoni people have received nothing. The exploitation has turned Ogoni into a wasteland: lands, streams and crooks are totally and continually polluted; the atmosphere has been poisoned, charged as it is with a hydrocarbon vapors, methane, carbon monoxide, carbon dioxide and soot emitted by gas which has been flared 24 hours a day for 33 years in very close proximity to human habitation. Acid rain, oil spillage and oil blow-outs have devastated the Ogoni territory. High-pressure oil pipelines crisscross the surface of Ogoni farmlands and villages dangerously. The results of such unchecked environmental pollution and degradation include the complete destruction of the ecosystem. Mangrove forests have fallen to the toxicity of oil and are being replaced by noxious neap palms; the rainforest has fallen to the axe of multinational oil companies, all wildlife is dead, marine life is gone, the farmland has been rendered infertile by acid rain and the once beautiful Ogoni countryside is no longer a source of fresh air and green vegetation. All one sees and feels around is death. Environmental degradation has been a lethal weapon in the war against the indigenous Ogoni people. Incidental to, and indeed compounding, this ecological devastation is the political marginalization, complete oppression, and Genocide of the Ogoni, and especially the denial of their rights, including land rights. At independence, Nigeria consisted of three regions. Since then 30 states have been created largely for the ethnic majorities who rule the country. Most of the states so created are unviable and depend entirely on Ogoni resources for their survival. The demands of the Ogoni for autonomy and self-determination even within the Nigerian nation have been ignored. The Ogoni had been corralled into a multi-ethnic administrative state in which they remain a minority and therefore suffer several disabilities. Mining rents and royalties for Ogoni oil are not being paid to Ogoni people. In spite of the enormous wealth of the land the Ogoni people continue to live in pristine conditions in the absence of electricity, pipe-borne water, hospitals, housing and schools. The Ogoni are being consigned to slavery and extinction. Faced by these terrible odds, the Ogoni people have continued courageously to demand social justice and equality. In October 1990, chiefs and leaders of Ogoni submitted a Bill of Rights to the Nigerian President and his council. The Bill called (a) for political control of Ogoni affairs by the Ogoni people, (b) the right to control and use a fair proportion of Ogoni economic resources for Ogoni development, (c) adequate and direct representation as of right in all Nigerian national institutions, (d) use and development of Ogoni languages in Ogoni territory and (e) the right to protect the Ogoni environment and ecology from further degradation The Ogoni are yet to receive a reply to these minimum demands. The extermination of the Ogoni people appears to be policy. The Ogoni have suffered at the hands of the military dictatorships which have ruled Nigeria over the past decades. The new constitution, which is supposed to usher in a democratic government in 1993, does not protect the rights of the Ogoni. Indeed, it institutionalizes the expropriation of their land. The recently concluded national census omits all references to the ethnic origins of all citizens, which in a multi-ethnic state is a violation of community rights. The Ogoni are faced by a powerful combination of titanic forces from far and near driven by greed and cold statistics. Only the international community, acting with compassion and a sense of responsibility to the human race, can avert the catastrophes which have overtaken the Ogoni. We respectfully invite you to visit Nigeria so you can see for yourself that indigenous peoples abound there and that they suffer incredibly at the hands of Nigerian rulers and the economic interests of other nations. Southwest portion of Nigeria including the Niger Delta and Ogoni regions. 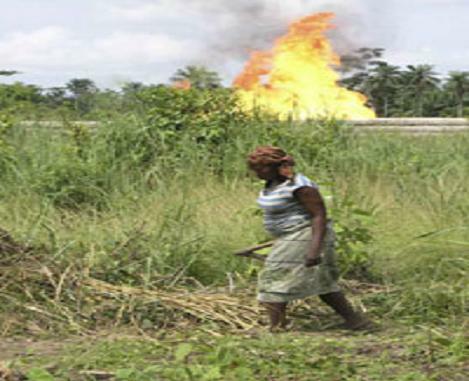 Typical gas flaring in Ogoni villages from oil drilling activities. 24 hrs a day near villages causing pollution, airborne diseases, and an obvious hazard to the villagers.